Image of the Notched trapezoidal monopole-antenna. The Notched trapezoidal monopole is an alternative version of the CPW-fed monopole which was included in the database for the release of Version 1.6.0. These antennas are popular for ultra-wideband (UWB) applications (especially in the FCC 3.1 - 10.6 GHz radio band) due to the reduced size and wide impedance bandwidth that can be achieved. The addition of the slot in the monopole adds a narrow-band, high-impedance resonance within the performance band of the antenna. Signals in this rejection-band will be poorly transmitted or received by the antenna. 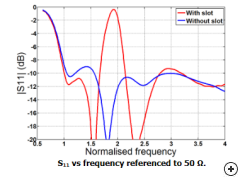 This behavior is useful in rejecting signals at specific frequencies within the operating band and reducing coupling between systems. The antenna is fed using a coplanar waveguide. The slot is U-shaped to allow sufficiently low notch frequencies. The design aims to have a reflection coefficient of below -8 dB across a 4:1 bandwidth and a mismatch of above -3 dB in the rejection band. 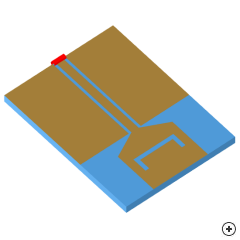 An advantage of this type of antenna is that it can be integrated on the same printed circuit board as the transmitter electronics and requires only one metallisation layer. The radiation pattern bandwidth is much smaller than the impedance bandwidth, but this antenna would typically be used in a multi-path environment where radiation pattern should not be a limiting factor. 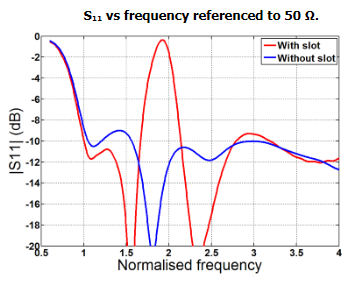 The following image compares S11 vs frequency for the identical monopole with and without the U-shaped slot. S11 comparison of the CPW-fed trapezoidal monopole (no slot) and the CPW-fed notched trapezoidal monopole (with slot).